is rated 1.0 out of 5 by 1. Mini-Stereo Audio Cable is rated 1.0 out of 5 by 1. 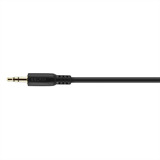 This 3.5mm Audio Cable connects portable audio equipment with mini-stereo jacks, including portable CD players, MP3 players, CD sound cards, and multimedia speakers. Rated 1 out of 5 by gesown from Looks pretty..lacks durability This cable worked very briefly until one of the connectors became loose. It no longer works.